Brazil is a developing country with major economic problems, with one-third of the population living in poverty. Brazil has one of the highest rates of violence in the world, much of it occurring in urban poor areas. In many instances, these conditions of violence are inter-related with common mental health disorders. 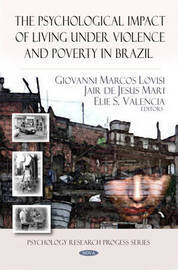 In this book, a number of social- demographic and clinical factors are postulated to explain, in part, the association among poverty, violence and mental health disorders in Brazil. Among these factors are gender, age groups, low level education, rapid social change, and living through a period of rapid and unpredictable social change, physical-ill health and mental illness. There are only a few investigations in Brazil addressing these issues of violence and mental health. Within this context, this book provides some scientific research data which might serve to inform the development of interventions, and encourage further investigations likely to benefit poor people with common mental health disorders in Brazil.